“Beautiful Boy”, based on a memoir by the same name, intimately captures the grim realities of drug addiction. Photo courtesy of Slashfilm.com. A few Fridays ago, I decided to spend my whole evening at Images Cinema. I watched Damien Chazelle’s First Man at 4:45 pm and Beautiful Boy immediately after. 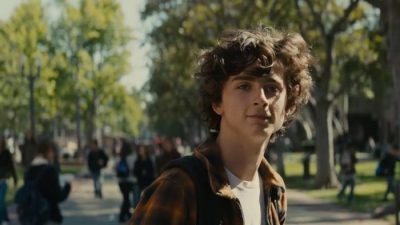 It comes as no surprise that teenage movie fanatics are wondering if Timothée Chalamet will get the Oscar this year. However, after watching both movies, I’m going to make a bold statement: no. While I don’t think Chalamet will win the Academy Award for Best Actor, this was his best performance yet and one of my favorites of the year. Beautiful Boy, which played at Images Cinema from Nov. 9 through Nov. 22, is based on the memoirs written by a father, David Sheff, and his son, Nic. The film chronicles Nic’s fall into drug usage and his addiction to meth, as well as recovery, relapse and the lasting effects of drug abuse on the Sheff family. The movie stars Steve Carell as David, Chalamet as Nic, Maura Tierney as Karen Barbour (David’s wife) and Amy Ryan as Vicki Sheff (Nic’s mother). Despite the story being centered around the consequences of drugs and Nic’s choices on the family, this is an atypical family drama. The film features many unnerving visuals, including meth and heroin usage, painful glimpses into relapse and withdrawal and raw emotion concerning Nic’s potential death. As this is Felix van Groeningen’s directorial follow-up to Belgica (2016), this is not his first rendezvous in filmmaking, which is clearly shown in the execution of the film. The movie tells an astonishing story with candid dialogue, uncomfortable character development and anxiety-ridden sequences. It doesn’t paint drug addiction in a light tone, which makes it hard to bear at times. For this reason alone, Beautiful Boy is not for everyone. For those who are uncomfortable witnessing “shooting up,” self-harm and intense psychological battles, this is not for you. That being said, this was one of the first movies I have seen that seemed to show the true nature of drug usage and recovery through these depictions. In terms of technical filmmaking, there are three aspects I try to pay attention to while watching movies: cinematography, score/sound production and timeline flow. One aspect of this movie I found subpar was its cinematography. Ruben Impens, director of photography, didn’t seem to capitalize on the artistic potential in Beautiful Boy. Other than the diner dialogue shots between David and Nic and the drug usage shots, the cinematography and colorization were bland. There was no experimentation or innovation in the shots, which we have admittedly been spoiled with in recent movies. Although the story in itself isn’t particularly conducive to extremely radical cinematography, there could have been more tinkering around with lighting and creative liberties surrounding artistic shots. After all, Impens’ artistic direction was phenomenal in the 2016 French horror film Raw, so why couldn’t he have done the same here? The next aspect is score and sound production, which I found to be satisfactory. The score contained great moments with emotional climaxes and eerie synths that built upon the anxiety of usage and overdose scenes. Sampha’s original song “Treasure,” which played in the credits, was a great addition to the soundtrack, along with appearances by Zola Jesus and Aphex Twin. That said, some of the music was just plain off. A few very emotional scenes were coupled with upbeat, almost happy songs, which detracted from the sincerity of the story. Aside from that, the addition of brilliant sound production and crisp dialogue audio kept the score on the net positive side. In terms of the timeline flow, I must admit that the timeline in this movie was occasionally confusing. There are many flashbacks where it is hard to tell if Nic has fallen into drugs yet and how old he is. It’s hard to follow along at first, but eventually, I began to understand when scenes were flashbacks or not, and thus understood the importance of such distinctions between his current state and past states. Despite these criticisms, Groeningen still adapted the memoirs brilliantly, as the movie doesn’t stray away from the reality of recovery: it is difficult. Throughout the story, we see Nic relapse time and time again. Perhaps what struck me most about Beautiful Boy is its timeliness. This is a movie reflecting the current times, despite it being based on something that occurred over a decade ago. The opioid and drug overdose epidemic continues to run rampant in the United States – and the Northeast, in particular – and Beautiful Boy provides an artistic depiction of the horrors of drug abuse. Most importantly, it emphasizes that drug addiction is a medical condition and dismisses the notion that users can recover on their own, for diseases require outside help. This movie makes an emotional case for there to be more extensive funding for rehabilitation efforts and that the system for drug abuse recovery needs to be revitalized in America. In the end, Beautiful Boy is an emotional roller coaster filled with great acting and real life takeaways. Although the story as a whole is somber, some scenes are particularly tear-jerking. And with award season approaching, I do expect Carrell and Chalamet to both be nominated for awards.